Black text (with language repairs/correction) in the work, and remove background color. 5. 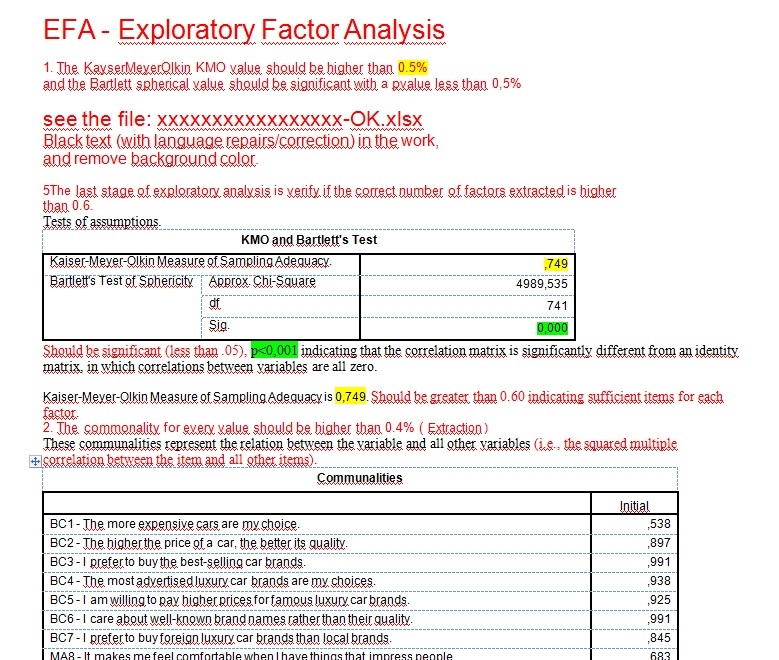 The last stage of exploratory analysis is verify if the correct number of factors extracted is higher than 0.6. Should be significant (less than .05), p<0,001 indicating that the correlation matrix is significantly different from an identity matrix, in which correlations between variables are all zero. Kaiser-Meyer-Olkin Measure of Sampling Adequacy is 0,749. Should be greater than 0.60 indicating sufficient items for each factor. These communalities represent the relation between the variable and all other variables (i.e., the squared multiple correlation between the item and all other items). BC1 - The more expensive cars are my choice. BC2 - The higher the price of a car, the better its quality. BC3 - I prefer to buy the best-selling car brands. BC4 - The most advertised luxury car brands are my choices. BC5 - I am willing to pay higher prices for famous luxury car brands. BC6 - I care about well-known brand names rather than their quality. BC7 - I prefer to buy foreign luxury car brands than local brands. MA8 - It makes me feel comfortable when I have things that impress people. MA9 - I think acquiring luxury cars can be seen as an achievement in life. Extraction Method: Principal Axis Factoring. Eigenvalues refer to the variance explained or accounted for. 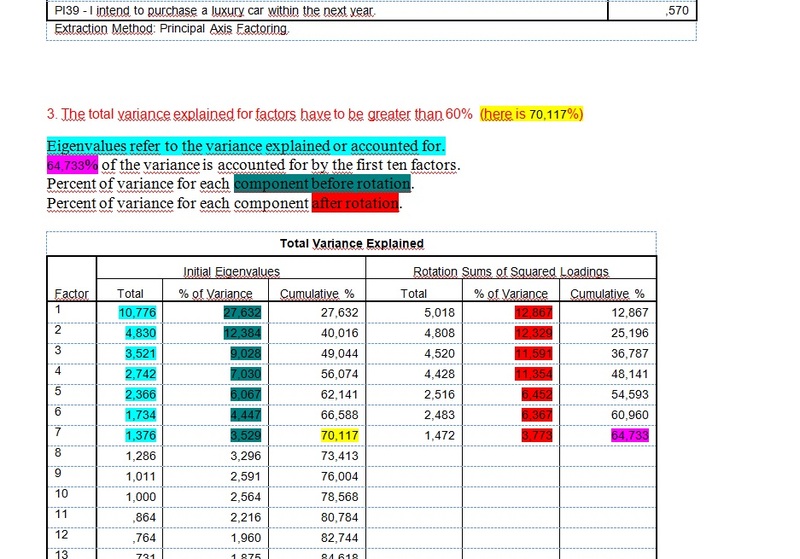 64,733% of the variance is accounted for by the first ten factors. 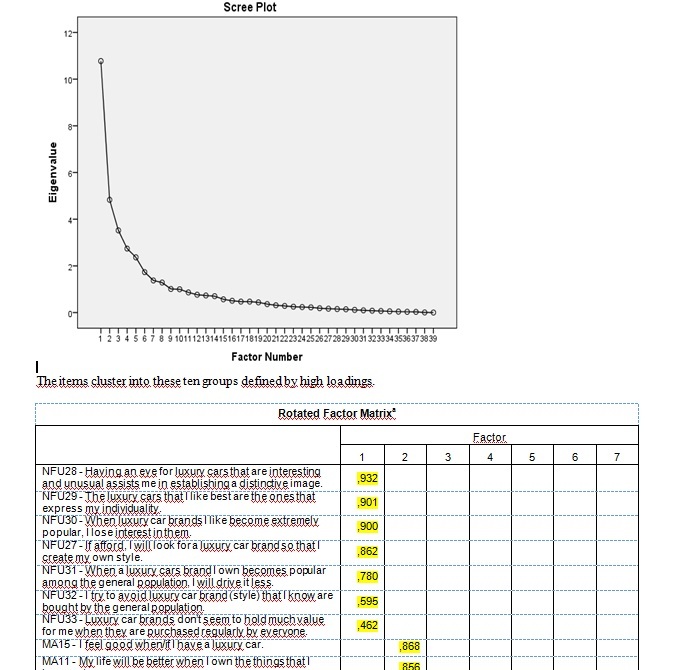 Percent of variance for each component before rotation. Percent of variance for each component after rotation.